In the latter case, it is not as sophisticated as software specially written for this task, but it provides the basic functions. 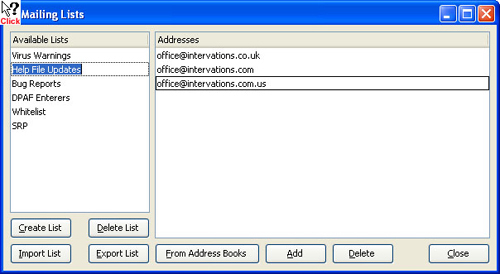 The list(s) of addresses is maintained from View Mailing Lists. for details see below. Adding/Removing Addresses - this will automatically add or remove members from/to the mailing list. The received message should contain information that uniquely identifies it, eg the subject line, or the address to which it was sent. Forward to a Mailing List - this will automatically forward the received message to the specified mailing list, without the need for user intervention. The received message should contain information that uniquely identifies it, eg the subject line, or the address to which it was sent. Note that the destination addresses will be placed into the To field of the message to the mailing list, so that members will be able to see each other's addresses. Redirect to a Mailing List - this will automatically redirect the received message to the specified mailing list, without the need for user intervention. The received message should contain information that uniquely identifies it, eg the subject line, or the address to which it was sent. Note that the destination addresses will be placed into the To field of the message to the mailing list, so that members will be able to see each other's addresses. Mail Back a File. - sends back file to the sender of the received message, such as the rules of the group or information about it. The received message should contain information that uniquely identifies it, eg the subject line, or the address to which it was sent. Received messages should be easily identifiable to ensure that they are handled correctly. rules.gerbils@mydomain.myISP.com - to mail back a text file containing the rules of the gerbils mailing list. add.gerbils@mydomain.myISP.com - to add the sender's address to the gerbils mailing list. remove.gerbils@mydomain.myISP.com - to remove the sender's address from the gerbils mailing list. gerbils@mydomain.myISP.com - for posts to the gerbils mailing list. The filter will forward any messages to this address to the gerbils mailing list. [rules.gerbils] - to mail back a text file containing the rules of the gerbils mailing list. [add.gerbils] - to add the sender's address to the gerbils mailing list. [remove.gerbils] - to remove the sender's address from the gerbils mailing list. [gerbils] - for posts to the gerbils mailing list. The filter will forward any messages to this address to the gerbils mailing list. Accessed from View Mailing Lists.